The next bridge across the Napa River is the Zinfandel Lane Bridge (21C0002), a two span closed spandrel masonry arch bridge built in 1913. The bridge is composed of two 43 ft long spans and like the other bridges we've recently studied over the Napa River it has only a 19 ft wide deck. 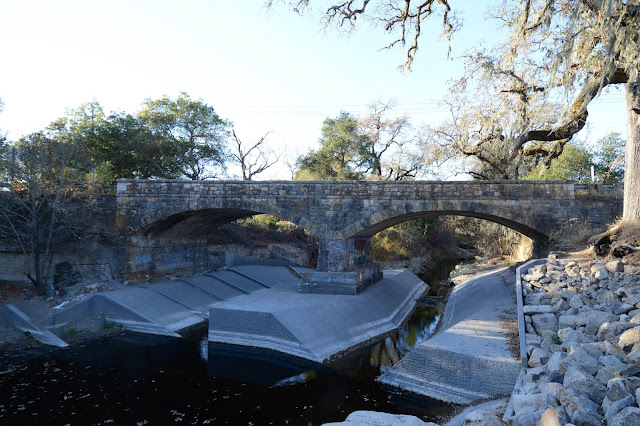 The most interesting thing about this bridge is the elaborate scour protection on the banks, which give this old stone bridge an odd appearance. However, Craig Philpott has some photos of the river flowing at flood stage on the Bridgehunter Website and the concrete revetment is doing a good job of protecting the bridge. Napa County, California Bridges: Zinfandel Lane Bridge across the Napa River by Mark Yashinsky is licensed under a Creative Commons Attribution-NonCommercial-NoDerivatives 4.0 International License.